There have been no public expressions of concern or worry coming from international donors since the government threatened the U.N.’s human rights office with closure last week in a move that marked a severe escalation in an already tense relationship. 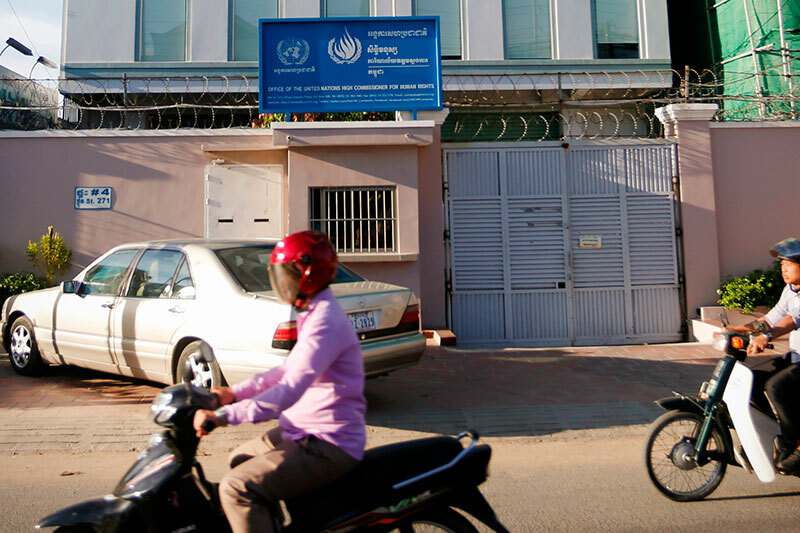 With the government claiming that the U.N.’s Office of the High Commissioner for Human Rights (OHCHR) has repeatedly interfered in its sovereign affairs by speaking out about human rights abuses, the office was given a December 30 deadline to either sign a more restrictive agreement to operate in Cambodia or close. Even though the diplomatic community has made no public show of their concern over the situation, leading donors to human rights causes in Cambodia—the U.S., E.U. and Japan—nevertheless said this week that it was important for the office to remain open. Andrea Giorgetta, head of the Asia desk at the International Federation for Human Rights, said donors were likely taking a conflict-averse strategy so the government was not backed into a corner as it negotiated a new memorandum of understanding (MoU) with the U.N.
“It’s probably that they don’t want to put themselves in a position to make the situation worse,” he said, explaining that more public pressure would only heighten the ruling party’s paranoia about international meddling. “The government would feel like they are under threat by the international community once again, so will feel they must react in a more forceful way,” he added. George Edgar, the E.U.’s ambassador to Cambodia, said the bloc was committed to international law, and that the U.N. was central to holding member states to account. “We are therefore hopeful that an agreement will be found between the Royal Government of Cambodia and the OHCHR,” he said. The Japanese and U.S. embassies offered similar sentiments. “The UNOHCHR field office in Cambodia is carrying out important and necessary work. Their continued presence reflects well on Cambodia’s commitment to human rights,” U.S. Embassy spokesman Jay Raman said in an email. Duch Piseth, advocacy director at the Cambodian Center for Human Rights, said he expected foreign governments to be more outspoken if diplomatic channels proved ineffective in persuading the government to reach a deal with the U.N.
Mr. Piseth said that foreign embassies were likely discussing behind the scenes about how to resolve the situation. “They still have a role to play to ensure these principles are respected,” he said, adding, however, that OHCHR’s effectiveness was being undercut by the government’s increasing reliance on China, which has little interest in human rights.